Last week I drove from Wellington to Gisborne, 9 hours drive up the eastern coast of North Island, and back, and was reminded again how stunningly gorgeous New Zealand is. The country is currently bedecked in autumnal splendour: end of season flax flowers standing in stark black against the sky, pampas grasses blushing pink and champagne and silvery lavender, the occasional stands of deciduous trees in a blaze of colour, meadows returning to lush green with the resumption of rain, and sudden storms bringing exhilarating downpours and rainbows at the end. So my Rate the Dress pick for this week comes in all these colours: though it’s not a style of dress that was ever worn in New Zealand! Plus, the totals are (finally) in for the feather bedecked confection of the week before! The general reaction to last week’s dress was that it just didn’t quite get the balance right. Something was missing, or was there that shouldn’t be, for almost everyone who commented. But as it was, not that many people commented – it got just over half the comments of the dress of the week before. Technically much more popular than the feathered dress of the week before – but certainly of much less interest to you! This week: an 1780s gown with an embroidered hem. 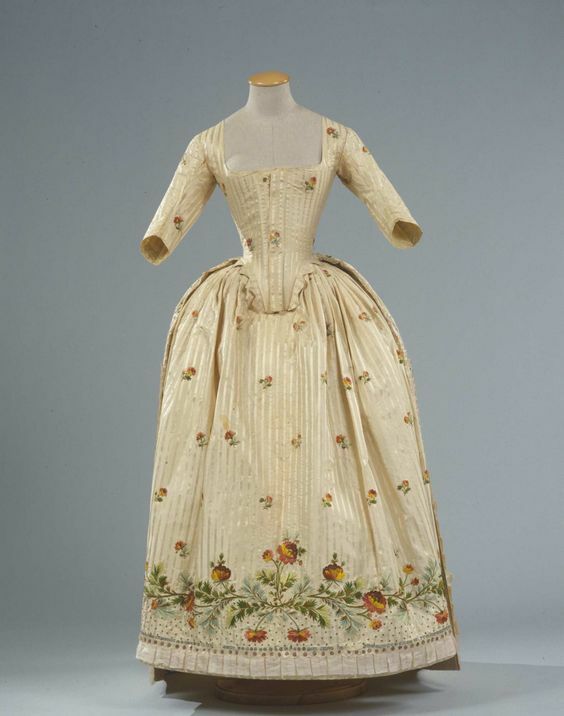 This 1780s gown features fabric with a small scattered floral motif, and an elaborate border of larger flowers and geometric patterning worked along the bottom of the petticoat and the edges of the overskirt. According to the Palazzo Pitti this dress is an Anglaise (bodice back and skirt back cut in one piece at the centre panel), but I think it’s actually an Italian gown (bodice back and back skirt cut as two totally separate pieces). However, the image resolution isn’t high enough for me to be certain, so I’ve stuck with the given description. 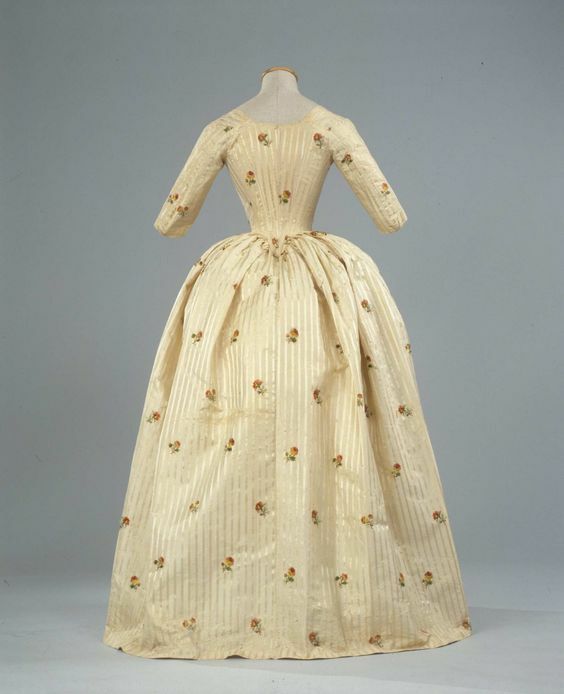 The elaborate borders make this dress quite formal, and at the cutting edge of fashion for the 1780s, showing the move away from the three dimensional trimmings & all-over patterning of rococo fashions, towards the flat embellishment and emphasis on lines and borders in neoclassical fashion. 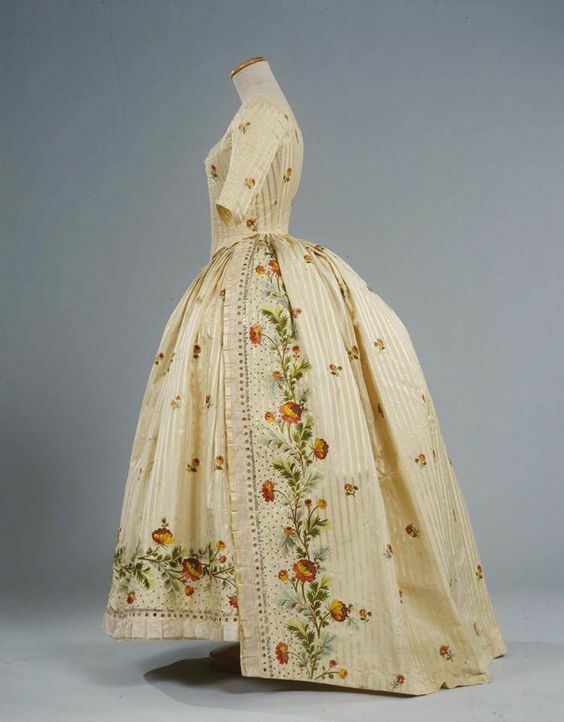 While the heavier fabrics, shape of this dress and the natural waist are still very much in the 18th century tradition, you can see how the design is moving towards the aesthetic seen in dresses like the embroidered 1790s number I posted a few months ago. This gown was definitely meant to impress in its day. Is it impressing today? A reminder about rating – feel free to be critical if you don’t like a thing, but make sure that your comments aren’t actually insulting to those who do like a garment. Phrase criticism as your opinion, rather than a flat fact. Our different tastes are what make Rate the Dress so interesting. It’s no fun when a comment implies that anyone who doesn’t agree with it, or who would wear a garment, is totally lacking in taste. That embroidery!! So beautiful. I love how it isn’t completely symmetrical/mirrored in the very centre of the petticoat, just enough to give it a little hint of informality, while still being light and airy and refreshing and beautiful. It feels light and bouffant and airy. Love it. I love the embroidery. And the whole thing just feels so light, with gorgeous colors. 9.5 out of 10. Not a 10, because it does not take my breath away as I believe a 10 should. Well I sighed of happiness. 10/10! It’s divine! I am utterly impressed. Those stripes and sprigs, the colors, the cut, so dainty! The artistry evident in that embroidery just wows me. Utterly lovely! The volume of the skirt really allows the embroidery to show to advantage. I just wish the hem treatment of the front had continued across the back. Art, glorious, and in such immaculate condition for a delicate object that is 230 years old! I am nuts for autumnal colours and htis is just delicious. I’d love to see it with all its trimmings. Lovely. I would dress it up with a fichu and engageantes, as the neck and sleeves are a bit bare. But I suppose that is how it would have been worn at the time anyway. Lovely!. So glad I had guessed it was Italian, this combination of crisp and light and exquisite feels very Italian to me. Delightful! Love the fabric and the silhouette. The color scheme is autumnal, but the crisp fabric seems cool and light. I could run through a lemon grove in this. Beautiful. Just a touch plain, but that could be because it’s missing sleeve and neckline lace embellishments. I love everything about this and would wear it in a heartbeat. Well what the heck, I will say more. I love the little pointed edging along the bottom of the bodice, such a nice detail. The striped fabric makes a great backdrop for the absolutely stunning embroidery. This is one where I don’t even have to think about my rating, I knew instantly that it’s a 10. There’s nothing I would add or change. And it’s easy to imagine a delicate fichu with whitework embroidery to fill the unadorned low neckline. Just mmmmm. This is a real beauty, I love the colours, the embroidery brings out the ivory, and every part complements the others. I want one, but don’t have the patience for that much hand-stitching! It’s very, very nearly a 10! I love the colour and especially the soft toned embroidery. That border is show-stopping. Which is who i can’t understand their decision to leave the back unadorned – continuing some of that into the back sort would have perfected it. I love this! The luster of the stripes, the exquisite embroidery, the pleats, pretty much everything is perfection. I do wish they had exhibited it with the proper underpinnings and accompanying frills so that it could have been viewed in all its glory. I’m always a sucker for Georgian dresses and this is no exception. The embroidery on it is absolutely stunning! I do wish the back had a little more going on to match the beauty of the front and sides. It’s still lovely from the back, but not breathtaking like the other angles. That is the only reason it isn’t getting full points. 9.5/10. All the good things that everyone has said. A breath of fresh air, this dress. And that embroidery! Oh my goodness! This is perfection! What a lot of work that went into the embroidery alone! Perfect for spring or summer special occasion. I love this dress. If I did this era re enacting, I would make this dress! If I could I would give it more than a 10! I adore it! 10. Would do 11 if allowed. It’s beautiful! I adore the 1780’s, and I can’t find a single thing to criticize here. I’m imagining it accessorized with some nice poofy white gauze and a large hat. It’s just lovely; as always with this silhouette I greatly prefer the side view to the front and back, and think more of the lusciousness of the sides could have been brought into the front decoration- but I expect it would have been offset by jewellery. Oooh. This one is really loveliness incarnate. I do wish it had a bit “more” to the collar and sleeves, but the lack of more wouldn’t remotely begin to keep me from flouncing around in this one in a fit of delight. It’s gorgeous, everything I like about the late 18th century – light, airy, delicate. And the vandyked trim at the waistline is the perfect finishing touch. Oh my god, I love this dress. I am in love with this dress. There are ridiculous cartoon stars and hearts in my eyes as I gaze adoringly upon this dress.